Just for a moment, lets get in the weeds to understand why this will work. Here are a couple of definitions that will help in understanding the concept. Wattage: In simple terms, a watt is considered a unit of power. It is not really a measurement of light. But since the invention of the incandescent light bulb we have used the consumption of power (wattage) rating as a reference to the light output. As for an incandescent light it consumes a lot more power than light produced. An incandescent light consumes (by generating heat) about 90-95% of its power to produce the amount of light it produces. In other words, its about 5% efficient. Lumens: Simply put; Lumens is as a measurement of the total amount of visible light, regardless of the consumed power or wattage. So, even though there is a relation, they don’t exactly correlate. An incandescent bulb heats up a metal filament (tungsten) in a controlled environment (bulb). That metal turns super hot resulting in both visible and non visible light as well as a lot of heat. Where a LED (light emitting diode), radiates light in a narrow spectrum, without the high amount of heat found with the incandescent bulb. Heat: Since LEDs radiate light, they emit very little heat. In comparison, incandescent bulbs release 90% of their energy as heat and CFLs release about 80% of their energy as heat. 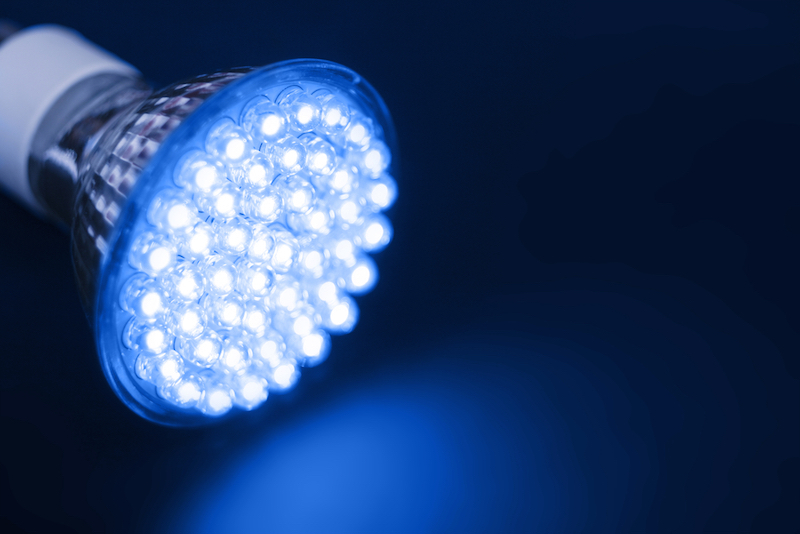 LED’s use about 75% less energy to produce the same amount of visible light. This should be the AH-HA moment for you. Taking advantage of the LED: Lets say you have a fixture that is rated at 60 watts, like maybe an old recessed kitchen light found back in the 1950’s. Its in the correct location, but you want more light. So without changing the fixture (assuming the socket and wiring is intact), you can upsize the bulb to a 2600 lumens equivalent, and still only use 30 watts of power. As a measurement of light you went from 800 lumens to 2,600 lumens with an increase of over 3 times the light of the original 60 watt bulb!! Impressive huh!! Granted the government will recommend that you replace the bulb with the 7 watts (800 Lumens)LED bulb. By using the 2600 lumens bulb you can increase your available lighting without having to change the fixture or exceed the wattage limitation. Granted you will about 23 additional watts of power, but I don’t even have to do the math to tell you its a lot cheaper than having an electrician add new fixtures. 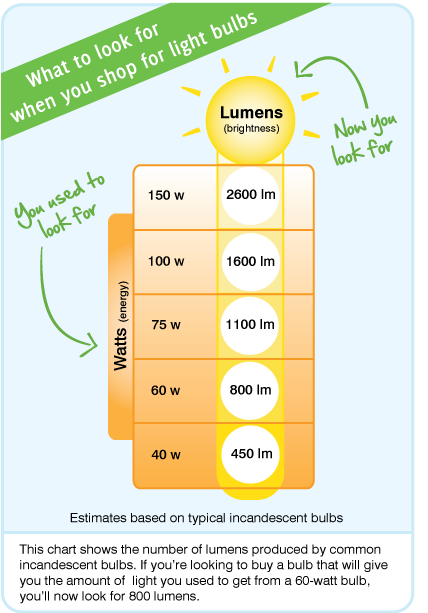 The chart to the left is a simple conversion of standard bulb wattage’s vs. lumens. The LED bulb is a great advancement and we will continue to see new uses and options with the technology. Hopefully I’ll have reasons to write future articles about LED’s. This entry was posted in Lamp Restoration Projects and tagged led bulb, led light, led vs incandesent, light bulbs. Bookmark the permalink.